Potential danger to life, risk of injury and property damage. Improperly performed repairs impair the safety of the windows and doors. Always have repair work performed by a specialist company. Inadequate maintenance may cause property damage. The maintenance intervals must be adapted to the respective ambient conditions. The maintenance intervals correspond to the current directives and represent a maximum time frame. Determine the appropriate maintenance interval in accordance with the ambient conditions. The maintenance interval for all tasks relating to the hardware components is annually at the least. In hospitals, schools and hotels, the maintenance interval is six-monthly. Incompatible cleaning agents may cause property damage. Incompatible cleaning agents may damage surfaces and destroy gaskets. Only use cleaning and care agents that do not adversely affect the corrosion protection of the hardware components and gaskets. Do not use aggressive or flammable liquids, acidic cleaners or abrasive cleaners. Only use mild, pH-neutral cleaning agents that have been diluted. Clean deposits and contaminants off the hardware using a soft cloth. Apply a thin protective film to the hardware, for example using a cloth soaked in oil. Clean windows or balcony doors according to the manufacturer’s specifications. Using incorrect lubricants may cause property damage. Substandard lubricants can prevent the hardware from working properly. Only use resin-free and acid-free lubricants. Lubricants may pollute the environment. Leaking or excess lubricants may pollute the environment. Remove any leaking or excess lubricants. Dispose of lubricants separately and properly. Observe the applicable directives and national laws. All functional hardware components must be lubricated on a regular basis. Refer to the hardware overview for the lubrication points and grease the lubrication points. Inspect hardware components for damage, deformation and a firm fit. Check that windows or doors run smoothly by opening and closing them. Check the window or door gaskets for elasticity and fit. Check closed windows or doors to ensure that they are leak-proof. Have damaged components repaired by a specialist company. 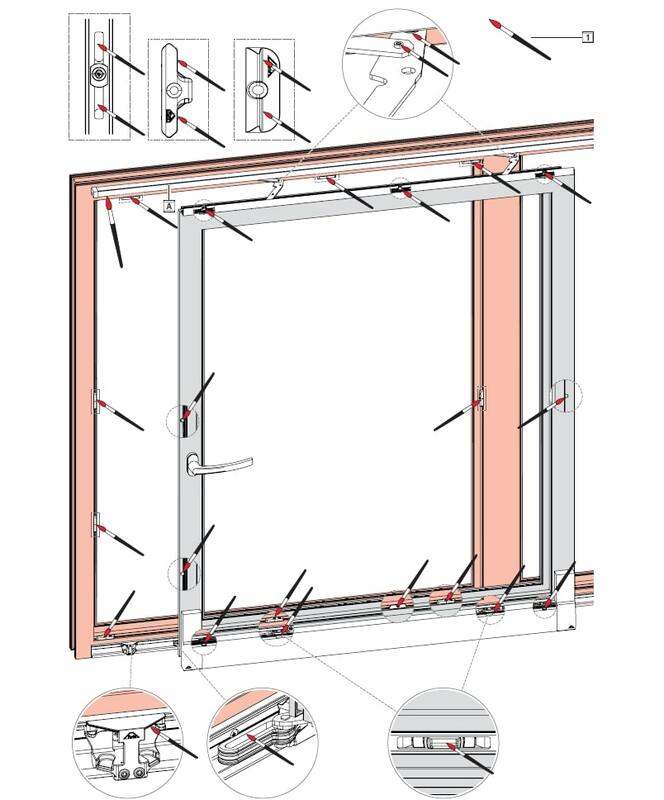 If windows or doors are not leak-proof, the hardware must be readjusted by specialist company. If the window or door scrapes against the frame when opened or closed, have the hardware adjusted by a specialist company. Improve the smooth operation of the hardware by greasing and readjusting. Surface treatments may cause property damage. Surface treatments, such as painting and varnishing windows or doors, can damage hardware or prevent it from working properly. Protect hardware against direct contact with the surface treatment. Protect the hardware against contamination. Repair work includes replacing and repairing components and is only necessary if components have become damaged after wear or as a result of external circumstances. The necessary repair work must be performed properly, according to generally recognized engineering practice and in accordance with the applicable regulations. Makeshift repairs must not be performed on worn or damaged components. Only original or approved spare parts, such as stainless steel screws, may be used in the course of repairs.